Love me some zoodles and this dish! It’s so light and refreshing. Perfect for the summer, and it’s totally raw so there’s no cooking involved and it’s super quick! It’s been soooo hot these last few days in Toronto. What a scorcher. This dish will definitely cool you off. Zucchini noodles are a great alternative to pasta and don’t have much of a taste, so creating a flavorful creamy sauce or pesto is key. Zoodles are so easy to prepare, all you need is a spiralizer and you’re set. This pesto is full of nutritional goodness. I threw it together with some fresh kale and garlic scapes from the farmer’s market. I also added sunflower seeds to the party to amp up the protein. Garlic Scapes are so delicious. All that garlicky flavour without that strong bite of a garlic clove. Heaven. These scapes pack the same nutritional value as the garlic that grows with it. Excellent source of B6 which breaks down glycogen for energy production. It’s involved in the formation of chemical transmitters in the nervous system and is critical in maintaining hormonal balance and proper immune function. It’s also a good source of minerals including phosphorus, calcium, potassium, iron and copper. Sunflower seeds are rich in protein. High in copper, which is an important factor in the production of red blood cells. This trace mineral is also important in the formation of an antioxidant and anti-inflammatory enzyme called SOD ( superoxide dismutase). Yup, with a name like that you know it’s badass. Sod plays a role in reducing internal inflammation and reduces pain associated with conditions like rheumatoid arthritis. Betcha didn’t think this little seed would be so powerful. 1. Cut off ends of zucchini and spiralize your little heart out. 3. Mix with zucchini noodles and Enjoy! 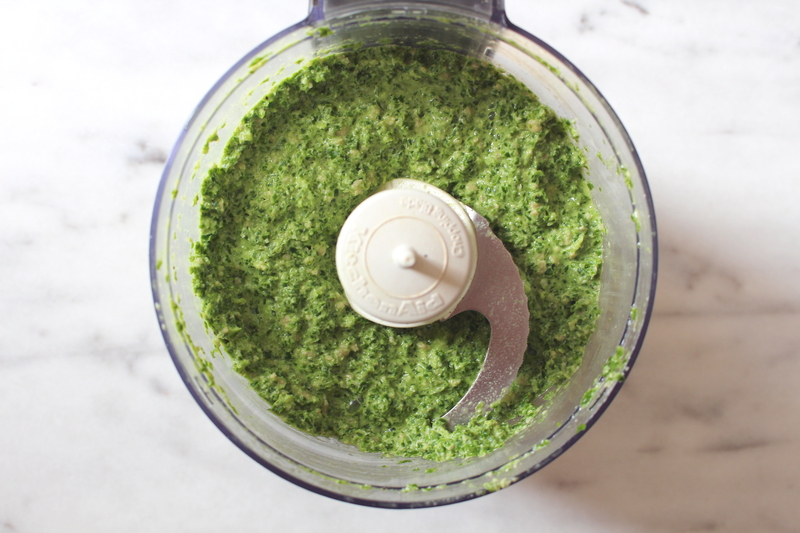 * This pesto will also make a great dip for some raw veggies.